I grew up on the Great Plains of West Texas, where the flat land and enormous sky dominate the consciousness. 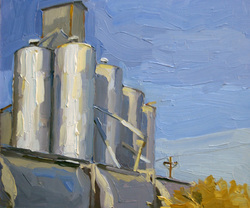 The old grain elevators are a vivid part of my memories and driving the expanses with my parents on various road trips. I saw them as giant ships sailing on the prairie ocean. Athwart the little, sun-bronzed towns that are already engulfed in the enormity of the Plains, the elevators are like decrepit lords that tower over everything. Though I don't usually paint landscapes, recent trips home had made me salivate at the structures, the massive silos and delicate pipes dancing with each other across the flat blue sky. So I took a week in 2006 to pay the old elevators tribute. I worked en plein air and attracted curiosity at every stop. Local residents would drive past first, then pull over and ask what I was doing. One young gentleman on his way in to town on Sunday saw my car on the side of the highway in Ropesville and he pulled over and alighted from his freshly washed and waxed pickup and came over, boots polished and dark jeans ironed, good hat on for church. "Are you all right?" He inquired anxiously, peering into the yellow stands of tall grass that I was working behind. "Oh, yes, I'm fine, just painting this picture." He seemed uncertain. "Oh, all right, I thought you was broke down." "No, I'm fine, thank you so much!" He nodded and with an "All right then, well, take care," he climbed back into his pickup and headed on. That was a dose of the neighborliness and courtesy I grew up with, where people in a sparsely populated land look out for one another. At the Muleshoe elevator an old Spanish gentleman made his cursory circuit and then pulled over to investigate. He talked to me for a while about the years he had looked after that elevator, occupying the small cottage crouched next to the huge silos. A thin sickle moon hung in the daylit sky as he suggested I take a whiff of the air, redolent of warm corn tortillas. The elevator processed corn and held it in the cooled silos until market day. At Clovis a couple of men stopped and said they were glad I was painting the elevator, because it was destined for the wrecking ball, the rails that ran past it no longer a track for grain. The same thing happened in Plainview. The stewards of the silos seemed always to be right on hand, though the elevators themselves are defunct. The changing economy has caused the agriculture in the area to dwindle to a few centers of output. The most evocative elevator in my memory was the Cone elevator near Plainview, an enormous monster of an elevator, dwarfing all the others in the region. The tracks that went under its silo were unused and an old locomotive was hunkered on the tracks, mired in tall grass.